U.S. 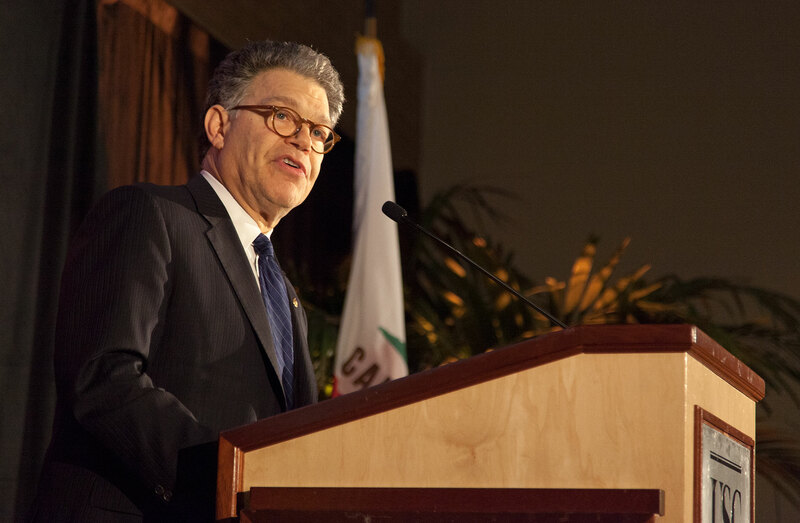 Senator Al Franken spoke about the influence of the Jewish tradition on public service on Wednesday at the 12th annual Carmen and Louis Warschaw Distinguished Lecture, hosted by the USC Casden Institute for the Study of the Jewish Role in American Life. The event was held in the Davidson Executive Conference Center. The junior senator from Minnesota, who was elected to Congress in 2008, used the charisma and storytelling skills that he developed as a Saturday Night Live comedy writer and political satirist. To many laughs and much applause, Franken began his narrative by talking about his father, who was a printing salesman. Though he spoke of the humble beginnings of growing up in a Minneapolis suburb, Franken maintained that he considered himself “one of the luckiest kids alive.” He credits his father with inciting both his love of humor, as well as his political views, which were largely shaped by images of the civil rights movement playing out in the south. “My dad, when he saw demonstrators being clubbed and having dogs sicked on them, he turned to me and my brother and he would say ‘That is wrong. No Jew can be for that,’” Franken said. His religious relationship with his childhood rabbi reinforced his ideas of righteousness. Franken said Paul Wellstone, who was Franken’s predecessor in the Senate seat and served as his member of the Democratic-Farmer-Labor Party, said he was an helpful example of the intersection between public diplomacy and civil rights. “It really wasn’t until I met the third Jew in my story, the professor, that I understood how public service represents a special kind of call to action, a special chance to do justice,” Franken said. Franken said that he developed a strong interest in politics while campaigning for Wellstone during his first senate race because humor was inherent a part of the field. Though Franken is known for his liberal political views, his speech was not political in nature. Rather, he spoke of politics as a vehicle for positive change. “Politics is about the improvement of people’s lives,” Franken said. During the question-and-answer discussion that followed his speech, Franken continued to emphasize the role of his Jewish heritage played in his public service experience. “I hope that your Jewish faith, your Jewish values and your Jewish role models are as powerful a source of strength and wisdom for you as mine have been for me,” Frank said as he addressed the Jewish people in the audience. Though those in attendance were primarily alumni and community members, students had positive reactions toward his speech. “I loved that it was a personal story. He’s a very political guy with very strong views, but I think the lecture stayed true to his purpose,” said Brandon Cheung, a freshman majoring in political science. Aaron Taxy, the president of USC College Democrats, said he was “star struck” following the event because of the senator’s eloquence. Some students said that it was the senator’s talent for storytelling that was the greatest highlight of his speech.